This cloisonne jewelry piece represents fusion of enamels and high karat metals to create a double-sided Canvas of Fine Sliver and 22k Gold. Coral Reef is a cloisonne jewelry piece created by Patsy Croft. It belongs to Ocean & Tropics collections of amazing enamel jewelry with unique jewelry designs. As an advanced diver, I’ve loved spending time in the reef, observing the behavior of our beautiful fish, urchin, starfish, and coral, how they interact, how they school and forage, and how, before you know it, they are all one big organism, moving together. 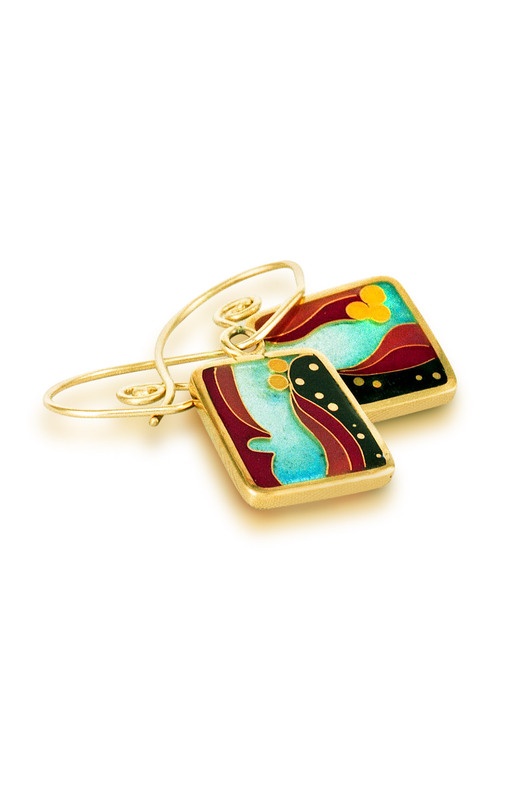 The movement of all the parts, forming one big picture, that was my inspiration for these cloisonné jewelry earrings. I first went into my painting studio and painted my design with watercolors, making sure that my colors were vibrant and complementary, symbolizing the feelings of love and protection that I wanted to convey. Then, I went to my goldsmith studio, and using fine silver, I fused my 24k gold wire lines, creating an empty palette to fill in with the vibrant vitreous enamel colors, and thus, the beginning of my unique jewelry designwas begun. My Japanese paint brush, with it’s long delicate bristles, collected three grains of enamel color at a time, as I painstakingly built up the colors into this roiling sea on the reef. Set in 18k gold, with starfish and fish on the back side, these enamel jewelry earrings are a striking testament to the delicacy of our ocean, yet they are also a witness to their cooperation and permanency, and our obligation to protect it. These unique gold jewelry earrings measure .5” x .5”. This jewel was the beginning of my movement to create double sided jewels. Enamel has to be applied to both sides of the metal to make the enamel stay on. There is an expansion rate of the metal and the enamels that need to match to adhere. I felt that the plain back was a canvas that was asking to be decorated! Enjoy!